(Central Islip, N.Y., June 30, 2015) – The Long Island Ducks defeated the Lancaster Barnstormers 3-2 in waddle-off fashion on Tuesday night in the second game of a four-game series at Bethpage Ballpark. Both teams traded zeroes until the bottom of the fourth inning when Jon Griffin reached on an error that scored Lew Ford and gave the Ducks a 1-0 lead. They stayed in front until the top of the seventh when a RBI single to right field by Brian Cavazos-Galvez tied the game at one. Lancaster took the lead in the top of the ninth on a bases loaded walk to Brandon Jones. However, Long Island rallied for two runs in the bottom of the ninth to win the ballgame. Randy Ruiz’s two-out, two-run single to center scored Reegie Corona and Bryan Sabatella for the winning runs. Neither starter factored into the decision. Ducks starter John Brownell pitched seven innings, allowing one run on five hits and one walk while striking out three. Barnstormers starter Bryan Woodall lasted six innings, yielding a run on eight hits and one walk with five strikeouts. Ryan Kussmaul (3-0) picked up the win despite allowing a run on two hits and a walk in the ninth. Zach Jackson (2-5) suffered the loss, surrendering two runs on one hit and one walk in two-thirds of an inning. Ruiz and Ford led the Flock with two hits apiece. The Ducks and Barnstormers continue their four-game set on Wednesday night. Game time is slated for 6:35 p.m., with the Bethpage Ballpark gates opening at 5:35 (5:20 for season ticket holders). It’s "Don't Zone Out" Night at the ballpark! The first 2,500 fans through the gates will take home a Ducks Static Cling Decal, courtesy of CSEA. It is also a Winning Inning Wednesday at the ballpark! Throughout the game, the Ducks will designate a specific occurrence for each inning. If the event occurs during that inning, one lucky fan will win $10,000! Right-hander Billy Buckner gets the start for the Ducks against Barnstormers southpaw Nate Reed. Tickets to the game and all Ducks home games are available by visiting the Bethpage Ballpark box office, calling (631) 940-TIXX or CLICKING HERE. Those unable to make the game can follow all of the action live on the Ducks’ official YouTube channel. Streaming video and audio will be available online by CLICKING HERE. Duck Tales: Long Island broke two franchise records on Tuesday night. With their 23rd win in the month of June, they set a new team record for wins in a single month. They had previously won 22 games in a month twice, doing so in August of 2000 (22-8) and July of 2003 (22-5). In addition, the Ducks broke the franchise record for wins in first half of a season with their 42nd. Long Island previously won 41 games in the first half of the 2014 season (41-29). The 42 wins also tied the mark for most wins by the Ducks in any half of a season, as they won 42 in the second half of 2000…The Ducks earned their franchise record 15th consecutive win at Bethpage Ballpark and finished perfect at home in the month of June. 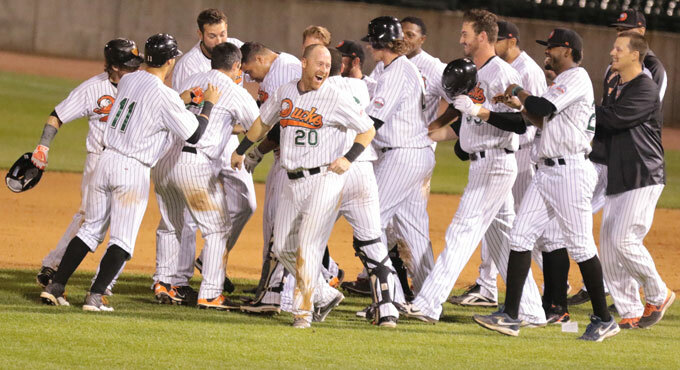 Long Island boasts a 24-6 record at home this season, which is the best in the Atlantic League (.800 winning percentage)…The waddle-off victory was the Ducks’ fifth of the season and third in the month of June. The previous two took place on June 7 against Southern Maryland and June 1 against York. In addition, it was Long Island’s second walk-off victory over the Barnstormers. Their first came on May 8 when Jon Griffin’s ninth inning double gave the Flock an 11-10 win. The Ducks have now totaled 19 come-from-behind victories in 2015…Lew Ford extended his on-base streak to 23 consecutive games with two hits and two walks. During the streak, the outfielder/bench coach is batting .420 (37-for-88) with nine doubles, one homer, 14 RBI and 18 runs. With his double in the fourth inning, he collected his Atlantic League leading 22nd two-bagger of the year. 2B--M.McDade (1), L.Ford (22), R.Corona (9). 3B--D.Cleary Jr. (3). RBI--B.Cavazos-Galvez (36), B.Jones (22), R.Ruiz  2 (18), J.Griffin (43). HP--B.Cavazos-Galvez (4), D.Lyons (5). SH--B.Nelson 2 (0), D.Lyons (0). LOB--Lancaster 5, L Island 11. DP--J. Brownell(P) - D. Lyons(SS) - J. - A. Feliz(SS) - B. Cavazos-Galvez(1B), D. Lyons(SS) - J. Griffin(1B), A.